I have always heard you can have 2 of the three important things: best price, quality, fast shipping. Many times in the past when shopping for something I have also found this to be true. I have never understood why people are like that, but it seems if they do good work at a reasonable price then it takes too long. If I want it done quickly the price doubles. It’s almost like some people don’t want to hustle and get as much done as they can. At Lugnut4x4 we do all three. Most orders ship same day or next day. Sometimes that is very inconvenient for me as I will be up late getting orders ready, or I have to pay extra shipping to get a product to me quickly so my inventory doesn’t get too low. To me it’s just part of running the business. It’s normal for me. We use priority mail so you get fast shipping. I am in Tennessee and can ship anywhere in the USA including Alaska and Hawaii in 2-3 days it doesn’t cost any more to ship to Alaska than it does 100 miles away. 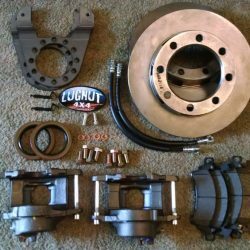 We have the best price brake kits out there. Most are $315 including shipping. The competitors cost more and then they add shipping. They run sale prices and promo codes to get their prices lower, but when you add shipping to their price it goes way up. My price includes shipping anywhere in the USA. No gimmicks here. When I advertise $315 for a brake kit that includes shipping. Above all we strive for quality. We use high quality pads like Wagner and PowerStop. 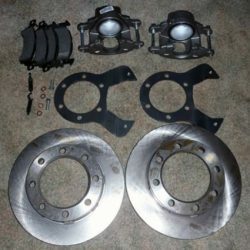 We have 5 caliper options for most kits including powder coated calipers. 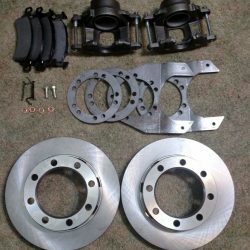 We even have slotted rotors available for most kits. Our brackets are laser cut for the most precise fit possible. I am always looking for ways to improve our product and with your help and feedback we are growing and celebrating another year in business.